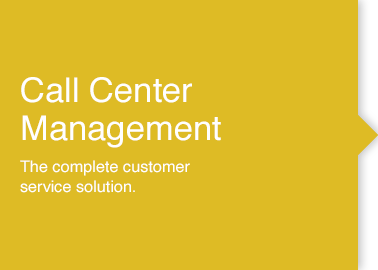 Call Center Management solutions create the foundation for positive customer service, a key factor in building a stronger business. Unified Customer Contact solutions provide the power of collaboration with contact center management tools that transform customer care from simple phone transactions to unique, rich experiences that can be customized to address the needs of individual customers. Call center management solutions can instantly provide employees with resources to deliver a higher level of customer service. They can quickly find answers to inquiries and connect with subject matter experts without having to put customers on hold or transfer them to another department. Build competitive advantage: Contact center management tools allow agents to use voice, web, email, and video to provide personalized, customer-centric services. Accelerate time-to-resolution: Advanced communications capabilities provided by contact center management solutions allow agents to quickly identify and resolve potential problems. Enhance customer satisfaction: Increased self-service options allow customers to quickly and efficiently bypass waiting for agent assistance, and can lower contact center management costs. Increase revenue opportunities: Advanced collaboration tools and rich media assist agents in creating more productive up-sell and cross-sell opportunities. By implementing Call Center Management Solutions such as “skills-based” routing or email and web integration, your workers are empowered to communicate more effectively and keep your clients satisfied. PCM is here to help find the right mix of Call Center Management Solutions for your organization. Contact us today. Featuring Lync, a unified communications platform that lets you connect with others through IM, video calls and online meetings. Offering mobile devices like the iPad which integrate into an organization’s unified communications solution. Offering integrated IP communications systems with voice, video, data, and mobility products and applications that lets you use your network as an intelligent platform for effective secure communications. HP Unified Communications (UC) Solutions integrate hardware, software and services to make organizations more efficient and speed up responses to business need. Dell SonicWALL® Converged Network Security solutions offer high-performance, multi-layered security, while maintaining Quality of Service (QoS) for time-sensitive voice and video applications. Cut costs and improve agent productivity with a Unified Contact Center IT Architecture. The RealPresence Platform acts as the unifying hub in your unified communications environment and works via open standards-based interoperability with communications and business applications from hundreds of vendors. Designed to enable seamless voice and video communication, the CudaTel Communication Server is an easy-to-use, affordable, next-generation phone system for businesses. Creating innovative products that allow people to simply communicate. Offering solutions that track, analyze, and control the security posture of all real-time applications utilizing the converged unified communications network. Enabling a truly integrated voice, messaging, PIM, apps and social experience built for business users. CA Technologies offers a network-based voice and video monitoring solution that helps organizations ensure both unified communications quality of experience and network quality of service. Logitech helps businesses unleash productivity and UC collaboration – from the desktop to the conference room.